The boxelder bug, Boisea trifittatus, is familiar to most people, though they may not be able to identify it by name. The adults are about 1/2 inch long, and have backs that are black with orange or red stripes beginning behind the head. The wings lay flat over the body in an overlapping manner that forms an X shape. The young bugs (nymphs) are less familiar; they are only about 1/16 inch long and are bright red when they hatch. Though their sheer numbers can be off-putting to many people, these are not insects that pose any danger of biting or stinging. Nor do they carry diseases or eat food. They do not eat wood and do not breed indoors. But these flying bugs with red stripes can appear in very large numbers and can be very annoying. And they may stain walls, furniture, and drapes with feces spots that are unpleasant though not much of a health hazard. Boxelder bugs can sometimes be found in and around houseplants as they seek moisture, but they do not cause damage to the plants. During the warm days of spring and summer, boxelder bugs live and breed in boxelder and silver maple trees. Although they feed on the leaves, flowers and seed pods of the trees, they do not cause much notable damage, so people rarely pay much attention to them during these months. But in the fall, when the boxelder bugs begin to take shelter in the structure of homes, the problems begin. Boxelder bugs often gather on the sun-warmed exterior walls, then squeeze into tiny cracks beneath siding, and under eaves. Usually, the insects simply overwinter there until the warmth brings them out again in the spring. However, these bugs are attracted to warmth, and this means that they may be drawn out of hiding by the heated air inside your home. As is the case with other insects such as stink bugs and squash bugs, boxelder bugs can detect temperature differences of as little as one degree. Use a vacuum cleaner with a long hose attachment to gather up the live boxelder bugs.Make sure to empty the vacuum cleaner bag into the outdoor trash immediately. Spray the bugs with a solution of two parts water to one part dish soap. This can kill the bugs when sprayed directly on them. When dead bugs appear, sweep them up with a broom, or vacuum them up. Never squash a boxelder, as it can leave a stain. 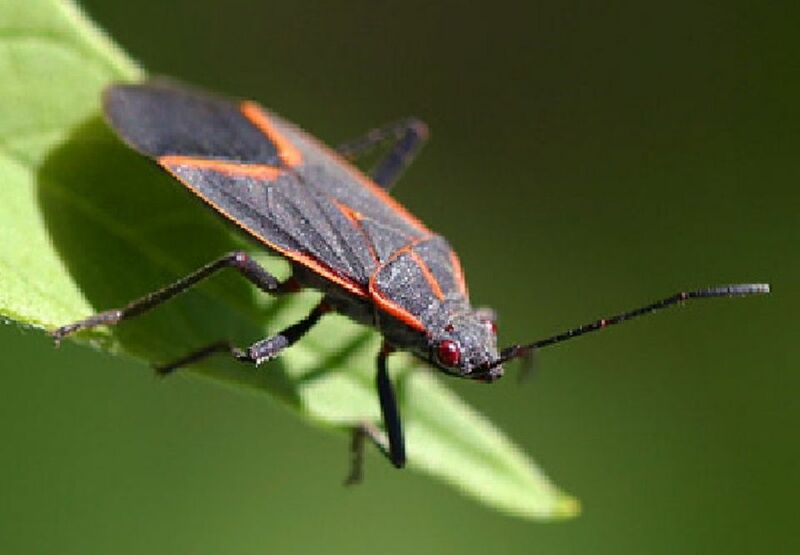 Control is most effective in the spring or fall when the boxelder bugs are just beginning to emerge (spring) or when they are beginning to seek shelter (fall). Install screens or caulk all cracks, crevices, gaps, and openings in your home's structure. Repair any torn or broken door or window screens, and make sure doors and windows are well-sealed. Although exclusion techniques won't always completely eliminate the boxelder bugs' entry, it can reduce the number of entry points and the number of bugs that get into your home. This can provide better control when combined with other techniques. A solution of two-parts water/one-part dish soap can be sprayed on the exterior of the home to kill bugs that migrate to the walls in the fall. However, this has to be sprayed directly on the bugs—it does not have a residual effect for bugs landing on it. Call a pest management professional to spray a residual insecticide on the exterior walls of the home where the bugs are found. This will help prevent the bugs from landing for a while, but be aware that it will not remain effective once cold weather sets in. A professional can also use a power sprayer on the trees to kill the nymphs before they can grow into adults and move into your home. Remove piles of rocks, leaves and other debris around your home. These areas provide the ideal hiding place for boxelder bugs. Keep the area around foundations free of leaves and weeds. Removing long grasses will discourage boxelder bugs. Dislodge bugs from siding with a forceful spray of water. Boxelder bugs are easily drowned. Boiling water poured over groups of boxelder bugs will kill them; remember, though that this will also kill plants and grass.